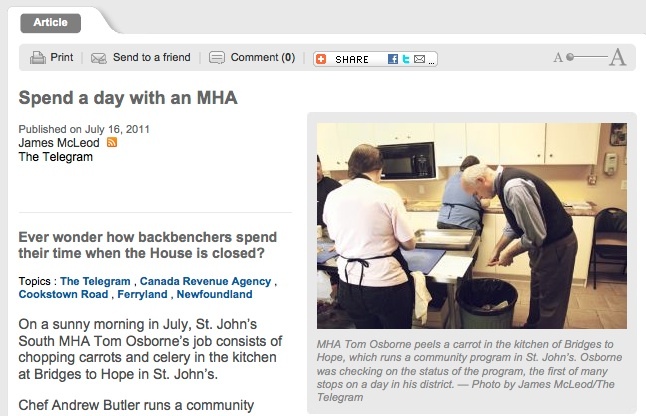 Reporter James McLeod spent the day with long-time St. John's South MHA Tom Osborne. Tom is with out a doubt one of the best district MHAs to ever be elected to the House of Assembly. He works hard building relationships with the community he represents. He has never take their support for granted, always assisting his constituents navigate the intimidation of the various levels of bureaucracy. 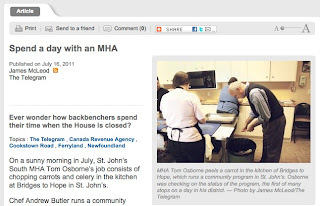 I will never forget the day after Tom was first elected in St. John's South. He defeated a bunch of people to win the nomination. He faced a fairly strong opponent in incumbent Liberal Tom Murphy, at a time when Brian Tobin was threatening to roll over the opposition. Osborne emerged victorious on election night. He hit the trail running the very next day distributing a constituent card, by hand, to every home in the new district. It made a great impression. After all, he was shattering the accepted belief that politcians only showed up at your door when an election was on the go. I took the card, which featured a picture of a very approachable Tom Osborne with a purple border, and wedged it onto my bathroom mirror to remind me every day that the opposition was hungry, dedicated and savvy. Despite having been an opposition backbencher, a cabinet minister and being shoved back into the government backbenches, Tom continues to be the approachable hardworking force of nature that others would do well to emulate.